Arguably, one of the most useful pieces of training equipment in Wing Chun is the Mook Jong, also known as the wooden dummy. When asked to picture someone practicing Wing Chun, more often than not, most people tend to imagine someone performing the 108 wooden dummy form taught by Ip Man, or something similar, on the Mook Jong. For all its training benefits, it does have its downsides. The biggest issue is its cost. Unless you build your own, the cost for a commercial wooden dummy can be very cost prohibitive, especially if you're on a tight budget. Another issue is that a wooden dummy isn't exactly portable. The only way to benefit from one is by actually being where one is located. Unless you have one at home, your skill development is going to suffer because of your limited access to one. With that being said, what would you say if I told you there was an alternative that provided most of the same benefits as a Mook Jong, was easily portable, and was available for under $40? Believe it or not, this piece of equipment actually does exist and is relatively easy to find or even make yourself from supplies found at the nearest hobby shop. What is this piece of equipment you ask? Well, it's called a Jook Wan Heun, or bamboo ring/hoop. Sometimes it’s also referred to as a portable wooden dummy. The Jook Wan Heun is simply a ring or hoop, usually made out of bamboo or iron, which has a diameter that's approximately the same diameter as the length of your bridge arm. They’re easily found on the internet at sites like Amazon. com, or if you want to craft your own, you can readily find suitable rings at most craft stores. According to at least one author, the training movements of the bamboo ring predates the ones found in the wooden dummy form. In fact, most of the bamboo ring exercises can be found within existing wooden dummy forms. The possible reason for the ring’s forms developing before the wooden dummy’s forms may have been directly related to the ring’s portability. When the different secret societies that were prevalent in the temple fled, due to increasing political pressure, it was easier to carry a small bamboo ring than one of the wooden dummies they normally practiced on. The ease and portability of a simple bamboo ring offered early Wing Chun practitioners provided strong motivation to develop effective forms to practice in conjunction with the Jook Wan Heun. A lot of the bamboo ring exercises were practiced and developed in the early years of Wing Chun's development by different opera house groups, like the Red Junk Opera troupe. The benefits of using a bamboo ring was that they could disguise their martial arts training by hiding the techniques within their dramatic performance training. Another benefit of using the ring was that it allowed them to practice their techniques while seated, again disguising their training by pretending to practice for an upcoming performance. Since it’s relatively small and light, the bamboo ring makes a portable training device that you can easily carry anywhere, providing you the option to turn any free time into valuable training time. Another benefit is, since it's inexpensive compared to a wooden dummy, it gives a practitioner the very real option of owing more than one of them. This gives them the ability to keep one at home, one at the office, and possibly one to carry with them wherever they go, allowing them the freedom to train anywhere they want while experiencing almost all the benefits associated with training on a wooden dummy. So if the idea of having a portable, inexpensive, and highly effective means to train your Wing Chun techniques anywhere you want to train, then you owe it to yourself to take a closer look at the Jook Wan Heun -- the portable wooden dummy. #2) Find a good video on bamboo/iron/rattan ring training by sifu Tyler Rea and other sifus on WingChunLife's Video MASTERY library. ** For a limited time you can save 15% on videos published by Everything Wing Chun or save 25% on videos published by Wing Chun University! 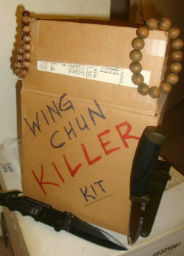 #3) Pick up the perfect Wing Chun training ring from Everything Wing Chun. They have rings made from bamboo, metal, rattan, and in many sizes to fit you. ** For a limited time, save 10% on training rings and other gear at Everything Wing Chun. P.S. Happy International Wing Chun Day! It's this Saturday March 21, 2015.